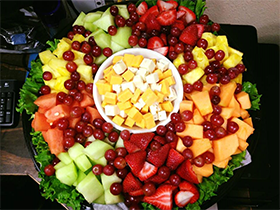 We can provide everything you'll need for your next group gathering. Whatever you call it, we've got the room to host your next gathering. Our expanded dining area is available for private functions, banquets, showers, meetings, reunions and more. Serving the finest food in Texas! Chuck Wagon Dinners - Great for Parties! Choice your entree, then we'll start ya out with a salad while its cookin! Each table served bowls of mashed taters n gravy, corn, green beans and bread comin to pass 'round and we keep it comin til yer all full up! It's like bein at grandma's house or maybe on a cattle drive at the mess tent! Let us cater or host your next gathering!